The post MasterMAN iRoom: Intelligent Roster Optimization appeared first on m-click.aero. We are excited to introduce MasterMAN iRoom, a brand new tool for the deployment planning of Air Traffic Controllers. The tool is fully configurable and tailored to the needs of small to medium sized airports by using flight plan and real-time data for the roster optimization. What used to be complicated and time-consuming paperwork becomes an automated, intuitive process. With MasterMAN iRoom you can not only reduce your labour costs but you simplify your deployment planning and you can prevent mental overload and underload of your ATCOs by allocating your staff intelligently. The post Introducing the future of flight optimization: GUIDOR by Skyconseil appeared first on m-click.aero. The post m-click.aero joins EUROCAE appeared first on m-click.aero. The post Tag der Luft- und Raumfahrt in Berlin-Brandenburg appeared first on m-click.aero. m-click.aero, the Aviation Software Company, participated at the 13th Day of Aviation and Aerospace Industry – Tag der Luft- und Raumfahrt – in Berlin-Brandenburg at TH Wildau. Matthias held a talk about Aeronautical Information Management by outlining challenges and opportunities in SESAR (Single European Sky ATM Research Project) and presenting the CLOUD4.AERO Aeronautical Data Platform that provides streaming flight plan data to the en-route flight trajectory optimization tool GUIDOR. The event was a big success: The short presentations gave an insight to the work and innovations of local companies, new business contacts could be made and the German Capital Region is positioning itself as a Player in the global Aviation and Aerospace industry. The post OGC Testbed 13 dedicated to Quality of Data appeared first on m-click.aero. The post m-click.aero and Human-Factors-Consult cooperation appeared first on m-click.aero. m-click.aero GmbH and HFC Human-Factors-Consult GmbH will cooperate in order to provide state of the art situational awareness services for aeronautical traffic management in multiple airport control. The companies will team up to combine m-click.aero’s expertise in the area of SWIM enabled aeronautical data integration, processing and delivery with HFC’s unique multi-airport control assistance MasterMAN®. With MasterMAN® HFC develops an innovative strategy and optimization tool, which supports air traffic and staff planning in multi-airport control operations. m-click.aero will provide the respective data integration and processing. This collaboration comes at a crucial time considering that already in 2015 the Swedish ANSP LFV is the first worldwide who perform Remote Tower Services. With the extension of LFV’s Remote Tower Center in February 2017, LFV can remotely control three additional airports from Sundsvall. During this spring, two airports will be connected and remotely controlled from Sundsvall. The German air navigation service provider DFS Deutsche Flugsicherung equip Saarbrücken Airport with a remote tower solution. The go-live is planned for 2017, with the airports in Erfurt and Dresden to follow. All three airports will be operated remotely from a remote tower center located at Leipzig Tower. Main goal of DFS is to centralize multiple tower operations in this single remote tower center and to maximize the efficient use of the tower controllers. In Europe alone, there are more than 240 small and regional airports with a traffic density between 100.000 and 2.000.000 passengers per year. This level of traffic density is appropriate for remote control operation and promises the largest efficiency benefits when applying Multi-Airport control. To control several airports remotely by only one air traffic controller is the next step of development and becomes more and more apparent. m-click’s Aeronautical Data Integration Platform as a Service (iPaaS) solution integrates aviation data seamlessly across applications, processes and systems, quickly and cost-effectively – on premise, in the cloud and between aviation stakeholders. It supports open standards such as OGC and SWIM and therefore the interoperability between aviation formats and standards. Consolidated aviation data provided by m-click.aero help out to to monitor the aviation traffic management process, providing a comprehensive data basis for collaborative decision making and improving situational awareness in the congested Europa’s airspace. HFC specializes in designing and configuring technical systems and software interfaces in terms of usability, product experience, acceptance and safety. With an interdisciplinary team that brings together expertise from psychology, engineering, mathematics and computer science, problems of hardware and software adaptation to humans are solved. These include the evaluation of assistance systems in the vehicle and the investigation of fatigue measurability. Our customers come from the aerospace, automotive, and railway industries as well as the departments of safety and medical equipment. HFC GmbH, founded in Berlin, Germany is privately held. For more information visit http://human-factors-consult.de or contact us at masterman@human-factors.de. m-click.aero is provider of a cloud-based Integration and Analytics Platform as a Service (iPaaS) solution for interoperable data integration that ensures the seamless flow of information across aviation SWIM and interconnected networks. m-click.aero enables its customers to easily and cost-effectively consume aeronautical, flight and weather data providing them implementing the SWIM paradigm, to the right place and at the right time, so they can easily communicate and coordinate with other aviation stakeholders. m-click.aero GmbH, founded in Berlin, Germany is privately held. For more information visit www.m-click.aero or contact us at solutions@m-click.aero. The post m-click.aero at World ATM Congress 2017, Madrid appeared first on m-click.aero. We invite you to visit m-click.aero GmbH at the World ATM Congress 2017, stand #137 and explore our on-premise and cloud-based solutions designed to support AIM workflows of all aviation stakeholders. Let’s give an introduction in our software components and web services and demonstrate how we enable our customers to seamlessly collaborate via SWIM providing and consuming aeronautical, weather and flight information, while ensuring the high quality of exchanged data. Easy-to-start and cost-effective, the components and services from our product portfolio fully support stakeholders demand for consolidated information in “the right place at the right time” giving them the efficiency and flexibility required for future aviation IT solutions. Aeronautical Data Repository – The AIXM Data Base. Please contact our aviation experts at solutions@m-click.aero to arrange a meeting during the show. At the World ATM Congress 2017 in Madrid you will find m-click.aero at stand #137. 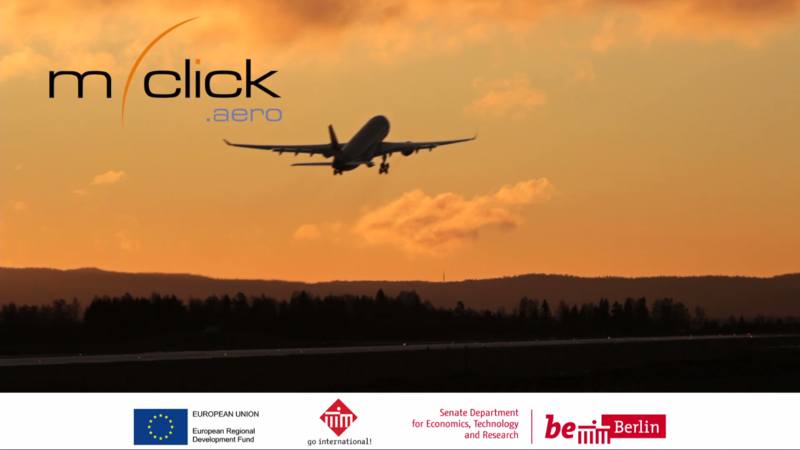 The post m-click.aero at SESAR SWIM Global Demo in Rome appeared first on m-click.aero. The post m-click.aero at ILA Berlin Airshow 2016 appeared first on m-click.aero. The post Validation of iWXXM Formatted OPMET Messages appeared first on m-click.aero.